Moreover, when monies from the tax amnesty program are included, the General and Education Funds are nearly $100 million above what the legislature had budgeted at this point in the fiscal year. Given how little time is left in the current fiscal year, it is highly probable that the state will end the fiscal year with more than what lawmakers had projected. The following data visualization is designed to help you understand the latest collections data. Within each tab, you can hover over each data point to view additional context. On the right side are seven radio buttons, which allow you to further investigate revenue trends by specific tax type or by total collections. The encouraging news has hinged on a small subset of revenue streams. As mentioned in a previous post, out of the nearly 20 streams of revenue available to the General and Education Funds, three are doing the heavy lifting: combined business taxes, the meals and rooms tax, and the real estate transfer tax. Excluding the monies received under the one-time tax amnesty program, these three are responsible for over 80 percent of the growth relative to the prior fiscal year’s collections. Even among these three workhorses, the share of the workload is being mostly carried by the business profits and business enterprise taxes, which have been performing exceptionally well throughout the entire fiscal year. If you click on the tab labeled Actual vs Previous and select the Business radio button, the data show how the two business taxes have done versus last year’s collections and legislative expectations. The likelihood of further business tax rate reductions due to the so-called “trigger mechanism” is high. 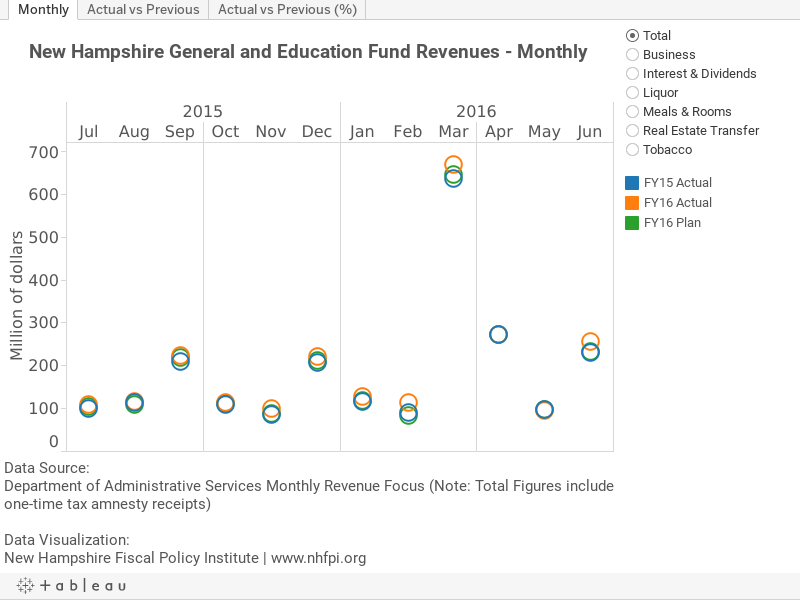 Under the budget compromise, SB 9, struck between Governor Hassan and legislative leaders last September, the statutory rates of the business profits tax and business enterprise tax were reduced from 8.5 percent to 8.2 percent and from 0.75 percent to 0.72 percent respectively for tax year 2016. Additionally, under the law, if the General and Education Funds collect at least $4.64 billion over the FY 2016-2017 biennium, then each of the tax rates are lowered again. Whether the state reaches this threshold will not be officially known until the end of calendar year 2017. Yet, given revenue collections so far, this outcome is very probable. Currently, the General and Education Funds have received $1.79 billion through the first nine months of FY 2016. To be conservative, let’s say they collect about $580 million over the last three months of the current fiscal year. For context, over the last three months of FY 2015, the General and Education Funds collected roughly $598 million. Thus, this conservative estimate assumes revenue collections will be worse in the last three months of this year than the last three months of last year. As discussed above, this is contrary to what has been happening. So, if the General and Education Funds were to collect $580 million between now and the end of June, then total FY 2016 revenues will be approximately $2.37 billion. That means in order to reach the “trigger mechanism”, FY 2017 revenues will only need to yield about $2.27 billion. This would be in the ballpark of a 4 percent reduction in collections from FY 2016. In addition, this would be slightly below the legislature’s $2.32 billion expectation for FY 2017. Given current economic data and the near-term outlook, this realization looks to have a very low probability. [i] This analysis excluded two former revenue sources: Board and Care revenue as well as the Medicaid Enhancement Tax.